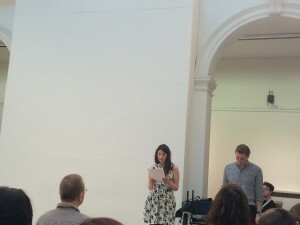 Since Group Critical Writing launched in 2014 as part of Studio Jamming: Artists’ Collaborations in Scotland, there have been a number of public reading events. In addition, with the support of Cooper Gallery DJCAD and editor Maria Fusco, participants of Group Critical Writing Residency have launched Writing Groups in Glasgow and Edinburgh. For more information about the writing groups please email exhibitions@dundee.ac.uk. In October Cooper Gallery was delighted to welcome writer and academic Jane Rendell to present a talk as part of the ongoing Group Critical Writing programme. Frances Davis is the Art Writer in Residence, reflecting and annotating upon CURRENT |不合时宜 in Shanghai. Find out more about the CURRENT project on the Cooper Gallery’s International Projects page exhibitions.dundee.ac.uk/current. Prompted by the exhibition Men Gather, in Speech…, seven Scotland-based art writers came together to present public readings responding to, reflecting on and annotating the ideas and concerns discussed in the works featured in the exhibition. This will extend the dialogue set in motion by the exhibition that explores the mode of address that underpins Western philosophy and importantly politics. The art writers presenting readings at the event were Frances Davis, Alex Hetherington, Helen Kellock, Valerie Norris, Penelope Matheson, Silas Parry and Gareth Vile. Drawn from the proposition that the work of Anna Oppermann acts as ‘a practice of thinking’, the roundtable discussion was a stimulating gathering of thoughts that elaborated and amplified the histories, politics and social reverberations of art practices in the 1970s and 80s, and the influence and impact they have on our thinking about art and culture today. ​The event included invited speakers Guy Brett (Curator and Critic, London), Lynda Morris (Curator and Art Historian, Norwich), Tobi Maier (Curator and Writer, São Paulo), Prof. Martin Warnke & Carmen Wedemeyer (Researchers, Leuphana University Lüneburg) and was chaired by Dr. Lisa Otty (Research Fellow, The University of Edinburgh). For more information please see here. Accompanying the Roundtable Discussion was a series of readings from art writers in Scotland: Frances Davis, Kirsty Hendry, Alex Hetherington, Catherine Street & JL Williams, and Richard Taylor. A cycle of readings by Edinburgh-based artists and writers presenting new work, accumulating distinct singularised voices into a prescient document of what it is to be contemporary in art in Scotland today. 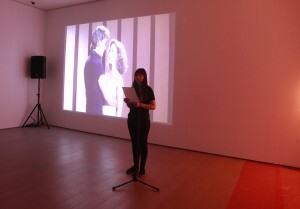 The event wasintroduced by Maria Fusco, Chancellor’s Fellow – Reader in Edinburgh College of Art. Readings by James Bell, Kirsty Hendry & Jake Watts, Daisy Lafarge and Collette Rayner, Gerry Smith & Mirja Koponen, Catherine Street & JL Williams and Richard Taylor. Staged in the Studio Jamming Hub at Cooper Gallery on Friday 25 July, the Jamming Symposium constructed a collaborative public ‘site’ to present the propositions, positions, exchanges and Declarations illuminating an expanded notion of collaboration. The symposium opened up a wider critical debate tackling and problematising the various contexts in which collaboration is situated. Centred on Declarations from Artists’ Collaborative Groups from across Scotland the Jamming Symposium featured readings by writers participating in the Studio Jamming Group Critical Writing Residency and keynote talks by international and national leading thinkers whose practices invest collaboration with depth and rigour. Keynote speakers include Stine Hebert, Maria Lind, Francis McKee and Markus Miessen. David Harding introduced the Declarations from Artists’ Collaborative Groups, the Group Critical Writing Residency readings was led by Maria Fusco and Dr. Dominic Paterson chaired the panel discussion.